In the following pages, we describe a six-night barge cruise from Rogny-les-Sept-écluses (on the Canal de Briare, in Western Burgundy) to the Seine river town of Saint-Mammès in the Upper Loire Valley. The cruise took place in early May, 2008 on La Renaissance, the flagship of European Waterways Ltd.
Our cruise was from south to north, with a descent through several dozen locks over a total distance of about 103 km or 64 miles. 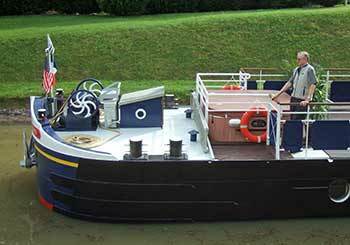 Every other week, the cruise goes the opposite direction, climbing through the locks from Saint-Mammès to Rogny-les-Sept-écluses. Depending on the direction of the cruise, the season, and occasional changes to the barge's schedule of shore excursions, your itinerary may vary from the one described in this annotated photo diary. For more information on the barge and European Waterways, see our eight-page La Renaissance cruise review.